"Modi is more pro-business than pro-market -- that is a subtle, but important, distinction; while politically the BJP has become the new centre of gravity," Dr Vaishnav, who recently won the Ramnath Goenka Award for Journalism in the non fiction category for his book When Crime Pays: Money and Muscle in Indian Politics, tells Rediff.com's Archana Masih in the concluding segment of a two-part e-mail interview. Obviously, the rhetoric has changed. The lofty talk of turning India into Gujarat, as he'd promised in the 2014 campaign, has slowly disappeared. The government has pivoted into more traditional areas like welfare and development. 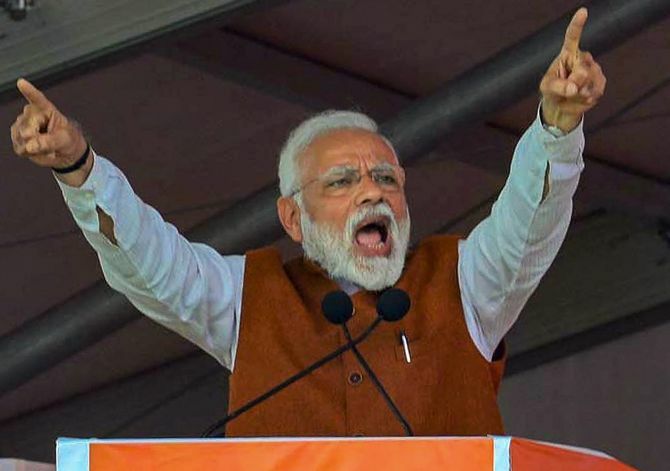 Modi still exudes confidence publicly, but I think he and the party have been rattled by the state of the economy, the Opposition's newfound collaboration, and the Congress victories in Chhattisgarh, Madhya Pradesh, and Rajasthan. We have seen serious reforms -- lifting FDI caps, GST, the new Bankruptcy Code, and so on. But we have also seen a serious bout of protectionism -- increasing tariffs, local content restrictions, the new e-commerce regulations that hurt Amazon and Walmart-owned Flipkart. I think the net assessment on Modi is that he is more pro-business than pro-market -- that is a subtle, but important distinction. I do not foresee it being the overarching theme, but it will be part of the layered messaging that the BJP deploys. And it is important to keep in mind that this messaging need not emanate from Modi -- it can be exploited by his surrogates. The alliance finalised a seat-sharing arrangement that left the Congress out in the cold --the BSP-SP merely said it would not contest the Congress pocket boroughs of Amethi (Rahul Gandhi's seat) and Rae Bareli (Sonia Gandhi's seat). But the most important impact -- in my view -- is that Priyanka's induction will provide free media time and marketing for the Congress. First, look at how many apex institutions have appeared to face a credibility crisis in recent years -- the Election Commission, the CBI, the Reserve Bank of India, the Supreme Court, the list goes on. I expect 2019 to easily top 2014. It could well double the 2014 estimate. This is not a partisan issue -- all parties (save, perhaps, for the Communists) will be spending inordinate sums to win this election.